Sarcoidosis is a multisystemic granulomatous disease of unknown origin. The first case of sarcoidosis was reported by Jonathan Hutchinson in 1875 and term sarcoidosis was given by Boeck in 1899. The first case of sarcoidosis with the involvement of oral lesion was reported by Schroff in 1942. This disease most commonly affects the respiratory system with approximately 90% of patients presenting pulmonary manifestation, 25% cutaneous, and 10–15% with head and neck manifestations. Oral involvement of this disease is relatively rare and mostly affects buccal mucosa, lips, gingiva, tongue, and palate. 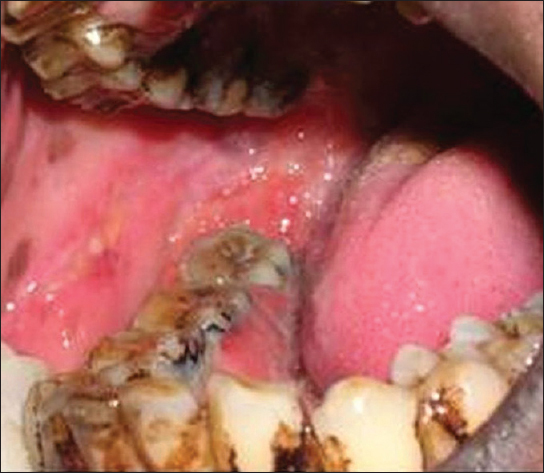 A 40-year-old male reported to the outpatient department with a chief complaint of ulcerated lesions on the buccal mucosa, gums, and palate since 2–3 years, which progressively increased in size. The medical history revealed persistent dry cough, dyspnea, fatigue, and pain in multiple joints since 2–3 years. Extraoral examination revealed no significant findings while intraorally multiple, asymptomatic ulcerated lesions on the right and left posterior buccal mucosa measuring 2 cm × 2.5 cm in diameter from third molar to retromolar pad area [Figure 1] and [Figure 2] and hard palate were observed [Figure 3]. 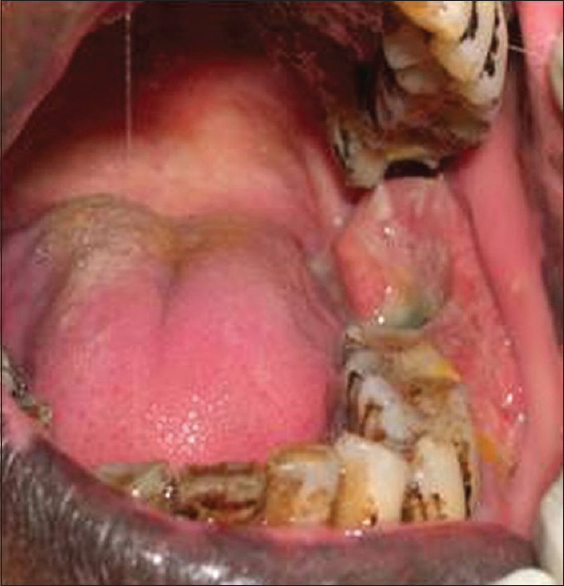 A diffuse erythematous gingival lesion was present on the facial aspect of upper anterior teeth [Figure 4] with multiple mobile teeth evident in the oral cavity. An orthopantomogram was advised, which showed severe alveolar bone loss [Figure 5]. Incisional biopsy was taken from lesions of the hard palate and sent for histopathological examination. The patient was referred to a physician for his medical problems, where he was advised hematological, biochemical, and pulmonary function tests along with a chest radiograph. Evaluation of forced expiratory volume and diffusing capacity appeared to show decreased pulmonary function. Analysis of blood calcium, 24 h urine calcium, and serum angiotensin-converting enzyme revealed higher than normal values [Table 1]. Posteroanterior radiographic view of the chest showed bilaterally prominent hilar shadows with soft parahilar opacities [Figure 6]. 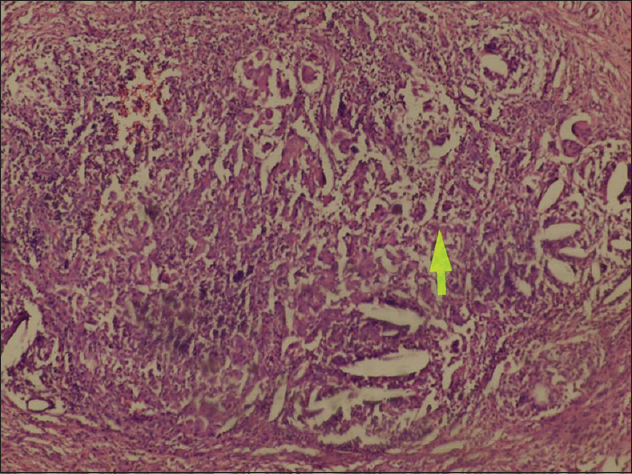 Histopathological examination showed numerous non-caseating granulomas which contained epithelioid macrophages and some multinucleated Langhans type giant cells [Figure 7]. The laboratory tests and histopathological reports facilitated the diagnosis of sarcoidosis. In the present report, the patient was treated with prednisolone 60 mg/day for the management of painful and progressive lesions in consultation with the patient's physician. A planned session of scaling and root planing was performed. Patient was instructed to maintain good oral hygiene with the use of soft toothbrush, tooth paste, and 0.2% chlorhexidine oral rinses. The mobile tooth were splinted and after 3 weeks there was marked clinical improvement and resolution of symptoms of ulcerated lesions on buccal mucosa, gums and palate, reduction in patient discomfort and improvement in masticatory function was seen after 3 weeks. Severity of sarcoidosis depends on the involvement of lungs and lymph nodes which can be accessed by chest radiograph. There are five roentgenographic stages of intrathoracic changes (Scadding 1961). Stage IV: End-stage fibrosis, cystic cavities, and honeycombing. 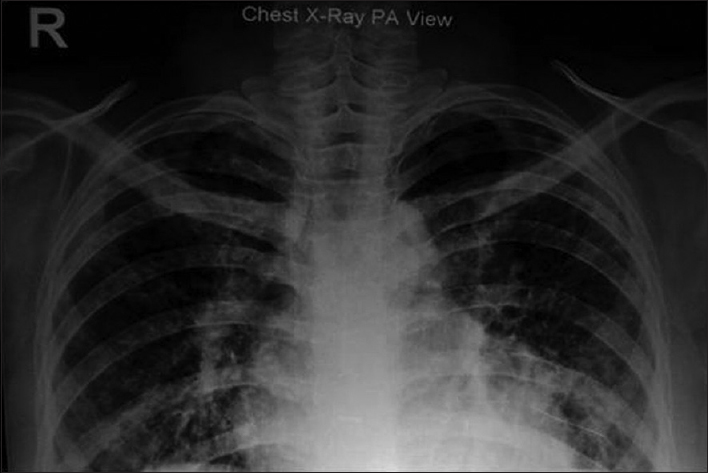 According to this report, in present case sarcoidosis was Stage II because chest radiograph showed bilateral hilar lymphadenopathy with pulmonary infiltration. In sarcoidosis, jaw bone is the most commonly affected site in the oral cavity which presents in the form of severe alveolar bone loss and loose teeth. Buccal and gingival mucosae are other less affected sites, along with lips, tongue and palate, which are least involved sites. These oral soft tissue lesions may at times be confused with other granulomatous conditions such as infections (bacterial, fungal and viral), Crohn's disease, and Mieschers cheilitis or Cheilitis granulomatosa. In Crohn's disease, the patient presents with gastrointestinal symptoms or other nonspecific lesions in the oral cavity, nose or larynx. In Cheilitis granulomatosa, swelling of lip with fissured tongue are associated findings. Infectious agents (bacterial, fungal, and viral) were ruled out by their specific stain tests. The specific tests for fungal (mycology tests for Candida species cultivation in SDA and CHROMAgar Candida), viral (Abs to HIV, Epstein-Barr virus, cytomegalovirus) and bacterial (for mycobacterium-skin test and AFB) infections were negatives. A recent review of the English-language literature turned up only 68 well-documented cases of oral sarcoidosis. The average age of the patients was 37-year-old, with a female/male ratio of 1.5/1. Twenty-one cases involved lesions of the maxillary bone tissue while 47 patients presented lesions in the soft tissue of the oral cavity. The most frequent localization is the jugular mucous membrane, followed by the gums, lips, floor of the mouth, tongue, and palate. In very few cases do the lesions affect more than one localization. Clinically, the lesions usually consist of diffuse enlargement at the submucous level or a nodular lesion, firm to the touch, with normal overlying mucous membrane. Papulae and superficial ulcerations have also been observed. Oral lesions do not normally produce symptoms and they are usually discovered as slow growth enlargements of the mucous membrane. Only some cases with pain and dryness of the tongue have been described. Management of oral sarcoidosis has been variable, ranging from no treatment to radiation therapy. Surgical excision and curettage were found to be the most common therapies, followed by systemic therapy such as steroids, methotrexate, hydroxychloroquine, and minocycline. Sarcoidosis presenting in the oral cavity as localized swellings may be treated with simple surgical excisions. 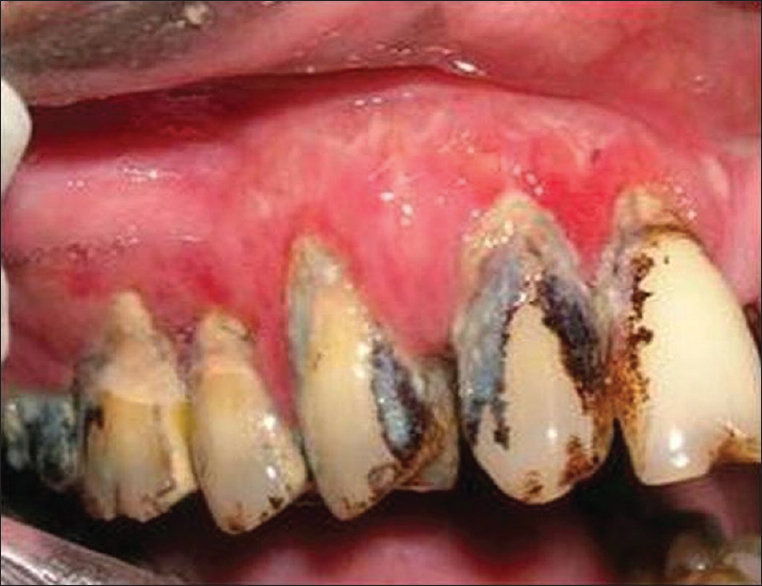 Presentations as gingival hyperplasia and gingivitis may be controlled by scaling, polishing, and strict good oral hygiene. Jaw lesions should be curetted and the mobile tooth should be splinted. Corticosteroids should only be considered in the painful and progressive lesions in consultation with the patient's physician. Sarcoidosis is a relatively common disease, but its oral manifestations are fairly uncommon. Oral lesions may be the initial manifestation of the disease. Clinical history, adjuvant hematological, and biochemical tests in combination with specific histochemical stains will help in a precise diagnosis. However, this multisystem disorder may never be completely cured. Moreover, it is important to enforce a periodic follow-up of patients in order to evaluate the disease. Suresh L, Radfar L. Oral sarcoidosis: A review of literature. Oral Dis 2005;11:138-45. DeLuke DM, Sciubba JJ. 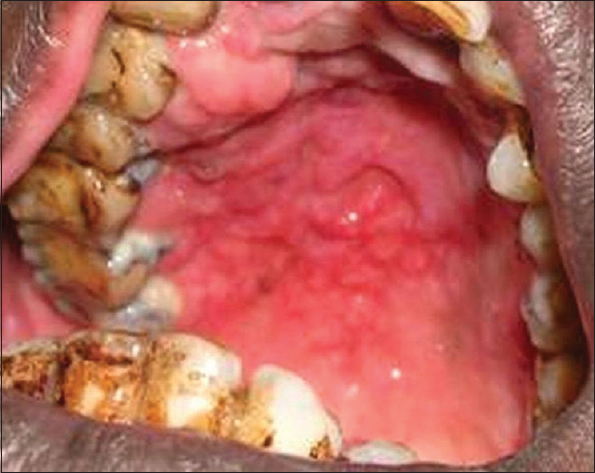 Oral manifestations of sarcoidosis: Report of a case masquerading as a neoplasm. Oral Surg Oral Med Oral Pathol 1985;59:184-8. Serrat Soto A, Lobo Valentín P, Redondo González LM, Sanz Santa Cruz C, Verrier Hernández A. Oral sarcoidosis with tongue involvement. Oral Surg Oral Med Oral Pathol Oral Radiol Endod 1997;83:668-71. Scadding JG. Prognosis of intrathoracic sarcoidosis in England. A review of 136 cases after five years' observation. Br Med J 1961;2:1165-72. Kasamatsu A, Kanazawa H, Watanabe T, Matsuzaki O. 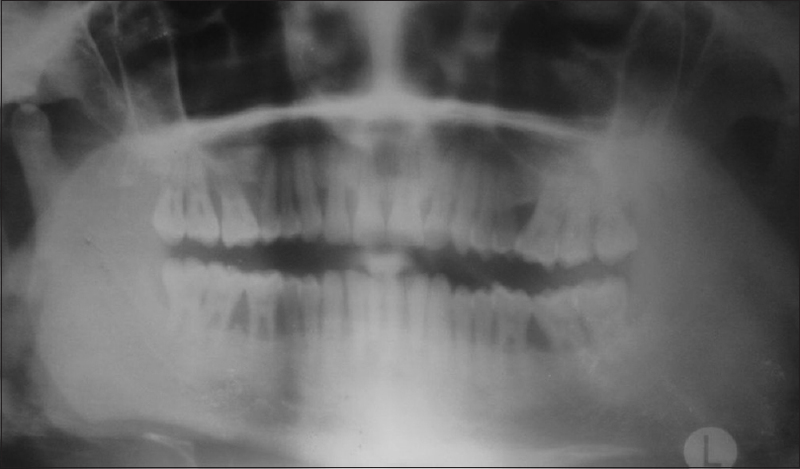 Oral sarcoidosis: Report of a case and review of literature. J Oral Maxillofac Surg 2007;65:1256-9. Pettersson T. Rheumatic features of sarcoidosis. Curr Opin Rheumatol 1997;9:62-7. Perruquet JL, Harrington TM, Davis DE, Viozzi FJ. Sarcoid arthritis in a North American Caucasian population. J Rheumatol 1984;11:521-5. Glennås A, Kvien TK, Melby K, Refvem OK, Andrup O, Karstensen B, et al. Acute sarcoid arthritis: Occurrence, seasonal onset, clinical features and outcome. Br J Rheumatol 1995;34:45-50. Di Alberti L, Piattelli A, Artese L, Favia G, Patel S, Saunders N, et al. Human herpesvirus 8 variants in sarcoid tissues. Lancet 1997;350:1655-61.